March | 2015 | My Things - Music history for those who are able to read. Here it is, finally another article from those golden days. Have you missed me? Well, sometimes paid work must take presedence over this little hobby of mine. 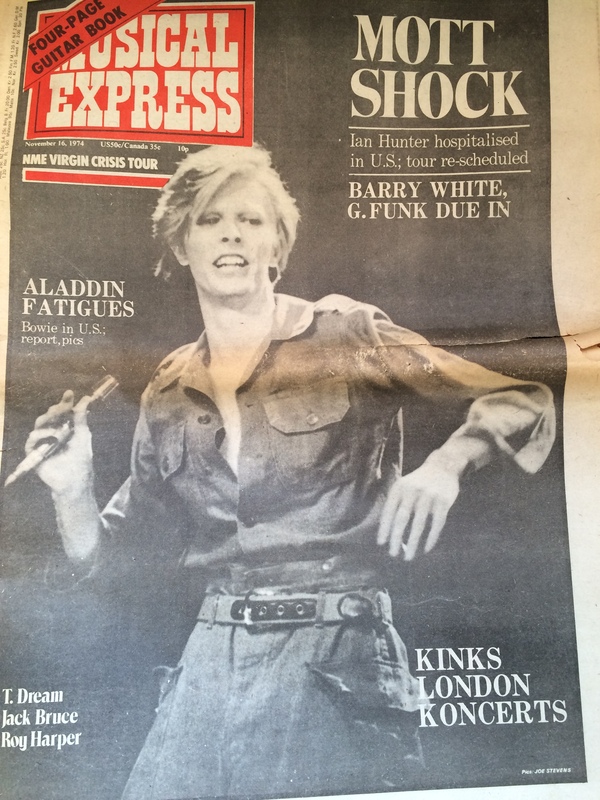 Today you get an article from one of Bowie`s adventures in America. They were still a little confused over yet another change of direction for him. If they only knew what we know now! See you later, and enjoy! And yes, we KNOW we`ve used that headline before – but what else could we call it? Funky Dory? The Man Who Souled The World? Just how corny d`you think we can GET? New York`s Radio City music hall, with its elaborate art deco Thirties interior, must be the ideal place to present a David Bowie show. Unfortunately the decor wasn`t enough to hold up the first two shows. All reports seemed to agree that the first early stagings in the five night stint were on the abject side of rotten. On the Sunday night, however, Bowie finally pulled it together and staged one of the finest live rock spectaculars that New York has been treated to in years. In many ways New York is Bowie`s city. It lends itself to the kind of social orchestration at which he really excels. As early as “Hunky Dory” days, he was courting the approval of the established Gotham Art Gang who have their epi-centre atWarhol`s Union Square Factory. Later, when his phenomenon burned bright in the sky, New York was, above all, the city where his style and image became the blueprints for the kids who roam the hothouse nightlife of Max`s or the 82 club. Bowie was the mother code for their experiments in the transexual exhibitionism that has never been so successfully exploited by the likes of The New York Dolls and Wayne County. Of course, Bowie has had an effect on kids throughout all of “Western Civilisation” where rock-and-roll has seeped in, but it`s been nowhere more intense than in New York City. Despite the adverse reactions to the first Radio City concerts, the effect was still as strong as ever. The crazies in the 82 might vehemently put down the Wednesday-night show, but they still felt constrained to disguise themselves in costumes from various stages of Bowie`s development. A couple of bad shows weren`t enough to stop the parade of look-alikes and oddities putting on their finery and hitting the the street because David was in town. Hot Tramp was still the signal in the afterhours booze-and-disco joints for the high spots in perverse juvenile display, and the kids from the suburbs – and even the small upstate towns – painted sinister bat-wings across their cheeks, climbed into their glowing spacesuits and Busby Berkley outfits, and headed downtown. The show they got, however – the experiment that reached its peak on Sunday night at Radio City Musical Hall – showed them a David Bowie who was very different from any previous incarnations. If you have to find a frame of reference for this new-look Bowie, the closest thing to it would be the James Brown Show, though that`s hardly an adequate description. The performance opened with the predominantly black thirteen-piece Mike Garson Band, including six back-up singers and guitarist Earl Slick from the previous tour. They do a swift, choreographed sub-Stevie Wonder, bless-all-the-people-and-don`t-forget-the-children act for fifteen minutes. An intermission follows, and then the slow moody curtain opens with the Garson squad doing a funky, almost “Talkin Book”-style, “Diamond Dogs”. Finally The Man comes out. Bowie is a strange combination of Funk, Katherine Hepburn, Dickensian Tweed dyke, and the young Elvis Presley in a blue workshirt, loosely knotted tie and ultra-short, tight tweed jacket. He swaggers across the stage swinging a W. C. Fields walking-stick. Moves like a cross between Fred Astaire and James Brown. The phenomenon of David Bowie fronting what amounts to an avant-garde soul show is a strange thing to watch. David Bowie is, in essence, totally unoriginal. He constantly borrows, steals and adapts. This is particularly noticeable in his visual presentation. He`s almost like an animated flick-book, moving fluidly from one pose to the next. The creativity lies in the outrageous juxtapositioning. One moment he`ll hit a bent knee, guitar slung across his back, pointing finger, total reproduction of a classic Elvis Presley photograph – the next he`s instantly switched to the brave little girl, a la Judy Garland. It`s almost uncanny how he can tread such a dangerous path with so much expertise. The posters out for this tour proclaim the message “David Bowie in a Complete New Show”. In some respect, the completely new thing about the show is the source Bowie is now borrowing from. He`s discovered the delights of being part of a funky-but-get-down-rock-and-roll band. Of course, it`s progressive stuff, but the British kids` favourite soul mannerisms are all there. He struts the stage like Otis Redding. He combines with the vocal unit to wring the maximum out of every song. To the consternation of the loyal and true fans, a few of whom came back to the hotel to show the security guys their 8,000 press clips of their David, the songs do tend to get mangled out of recognition. Imagine “1984” done in the style of The Temptations, or “Rock `n` Roll Suicide” turned into a soul sobber on the scale of “I`ve Been Loving You Too Long”. The prospect is at once awesome and objectionable. It depends on the conservatism in your heart. The whole thing has the streamlined professionalism of a chitlin` circuit soul review. The change-overs, although still slightly sloppy, went like lightning compared to the usual standards of first division rock-and-roll. The curtains are used for dramatic effect, and at the end of the show, after a statutory “Diamond Dogs” encore, a voice announces that “Mr. Bowie Has Left The Theatre”. It kills the kids demanding a Second Coming stone dead. They leave the theatre with a fine sense of quietly hunting for more. The party afterwards at the Gramercy Park Hotel gave the New York Glittzers a chance to mingle with the cast and characters of the Radio City ensemble. Bowie, supping on sturgeon and sipping Dom Perignon, held animated conversation with David Johanssen of the Dolls, Tony Visconti, and Wayne County (sans wig and looking very straight). Talk ranged over a January `75 tour of Brazil, the Liz Taylor/Bowie silver screen debut shelved till next year, an album recorded in Philly for release in January, and the April/May/June tour of England, Scotland and maybe S. Ireland and the Continent. 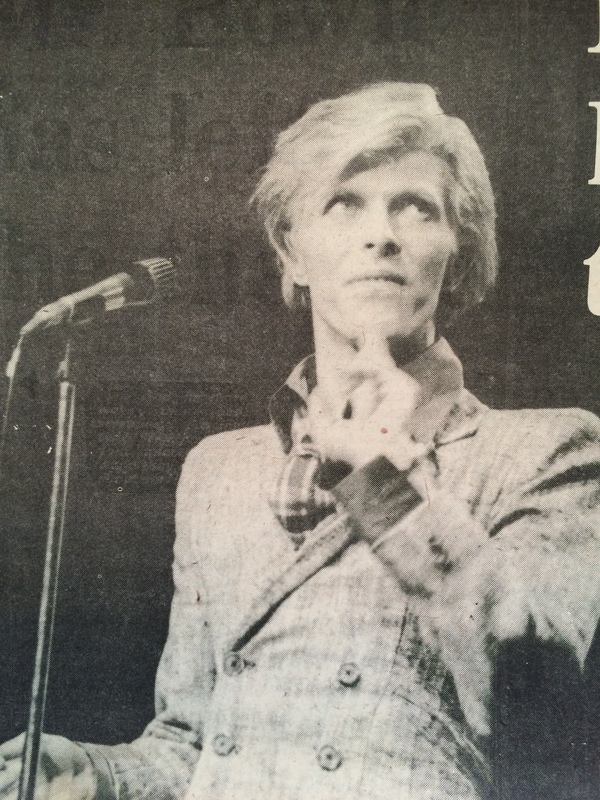 Next day the rumour mill tells us that Bowie`s leaving early to drive to Cleveland, the next stop on the itinerary. This kind of irrelevant information is very important in the incestuous little community that hangs around any major rock tour. Vampirella and chums fade from the lobby, and slink off to their lairs to lurk in wait for the next passing superstar. The rest of us make our own plans for the hop to Ohio. On the plane to Cleveland I sit next to a character in an expensive brown business suit and cashmere sweater. It turns out that he`s a tour manager for Ringling Brothers Circus. Ringling Brothers open in Cleveland the same night as the Bowie concert. The Circus has booked the biggest arena in the city. Bowie has the second biggest. Ringling Brothers are sold out for twenty days. David Bowie and his completely new show are only sold out for one. Rock-and-roll is put firmly in its place. It rallies slightly when the circus man remarks that his younger clowns have been warned that, if they sneak off to see Bowie and miss the show, they are liable to be fired. The Cleveland Public Auditorium is about the size of Wembley`s Empire Pool. Its decor is a little more sprightly, but the acoustics have the same air-hanger rankness that eats even the best P.A. for breakfast. To make matters worse, Bowie is suffering from laryngitis and his voice is failing fast. He works hard, pulling with every register that hasn`t been burnt out, but it still doesn`t sound right. The only thing to save the show are the musicians. Behind Mike Garson`s rather overbearing conducting and multiple keyboards, they carry Bowie to, if not a semi-triumph, at least a suitable show for Cleveland. Cleveland`s a solid, serious industrial town sunk in rain and mounds of pollution. The audience is for the most part in sensible blue jeans and lumberjackets. A few are decked out in fancy coats and fancy shirts, a few have daubed Aladdin Sane/lightning-flashes on their faces – but lower down are their best Friday night a disco frocks. One young lady rushes forward and nervously hands Bowie a bunch of white flowers. He holds them for a while and then hands them to Miss Ava Cherry, one of his back-up singers. He explains that it is her birthday. It`s all very polite and homely. There`s nothing like the gangs of ravening androgynes (a blast from the past) who rushed the stage in New York. The musicians even grin at each other while they play. Bowie appears tongue in cheek, a little camply outrageous, but basically friendly. Although he cops a few of Jagger`s poses, there is no hint of Satanic Majesty. It`s all so nice that you could almost see him joining Elvis and Tom Jones on the casino circuit. He also looks incredibly tired. The show is shortened to an hour and there is no encore. The curtains close and before the clapping and yelling have seriously gained momentum the “Mr. Bowie Has Left The Theatre” booms out. The audience obediently leaves. The police department herd out the stragglers and it`s all over. Kids walking home in the rain are bitching a little about how short it was, but nobody makes any serious complaint. Back at the Holiday Inn, things are far more stable than they were in New York. There are a few grungy Vampirellas in primitive face-jobs and some ladies maintaining they represent local radio stations. The roadies, security men, and journalists move in. They exchange heroic professionalisms, treat the ladies as colleagues and start asking them to come up to their rooms. Bowie appears and vanishes in a flurry of retainers. He comes back, but again splits. The drummer and bass player of his band commandeer the local combo who are playing in the bar. Bowie returns for a third time and finally settles in a corner to smile and watch his boys have fun. In an evening of juxtapositions, one in particular stands out. On our way out of the auditorium, two posters stare down from the wall. One announces Bowie – the other James Brown for the following week. The motives behind this odd change of direction can for now remain only as speculation. It could be that Bowie, having moved as far as he could in terms of rock spectacle, is now re-examining his music. The other alternative is that he is Retreating From The Edge in the basic Bob Dylan scenario. Either way, Mr. Bowie seems, for the moment, to have left the theatre. A really strange ad, but very confident! 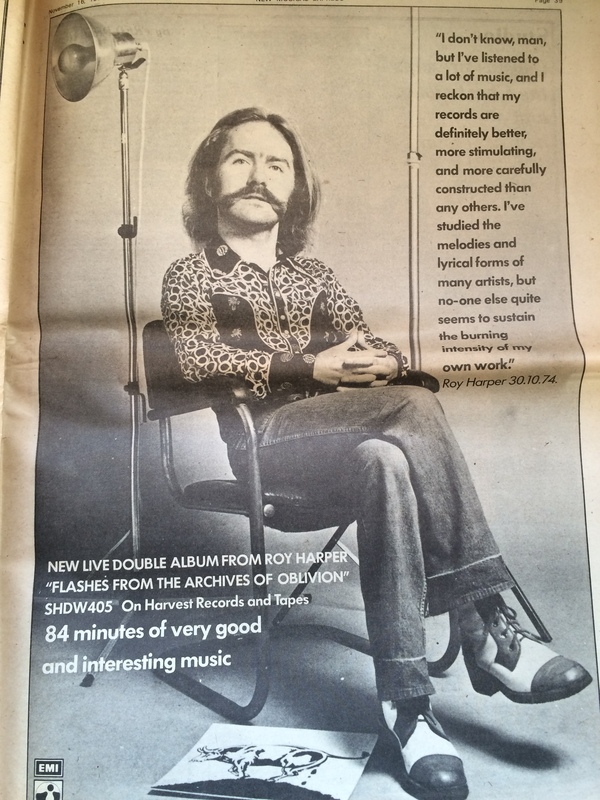 This number of New Musical Express also contains articles/interviews with these people: Tangerine Dream, Tim Rose, Bill Bruford, Peter Noone, Jack Bruce, Roy Harper, Hatfield and the North, Dave Cousins, Frank Zappa, Planxty, Andrew McCulloch.